PET SHOP BOYS | Love Etc. Written by Neil Tennant, Chris Lowe, Brian Higgins, Miranda Cooper, Tim Powell & Owen Parker. Keyboards & programming: Chris Lowe, Tim Powell, Fred Falke, Matt Gray, Brian Higgins, Owen Parker, Sacha Collisson. "Love Etc." 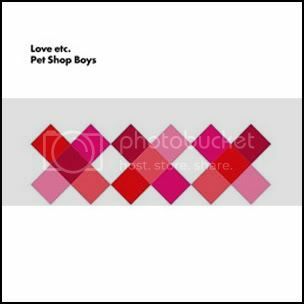 is the first single from Pet Shop Boys' tenth studio album Yes. It is one of the three songs from the album co-written with Xenomania. The single was released on March 16th. Peak position: #14 in the UK singles chart. x Neil Tennant: "The first single off our album was actually a track that Xenomania were keeping for a project they were going to do themselves. We managed to wrestle it from their solo project on to our album and then I came up with the idea of 'You don't have to be beautiful but it helps.' That became the basis of the lyric. Miranda wrote a very clever melody for the 'Boy, it's tough getting around the world' part, which isn't a melody either myself or Chris would have come up with. It's actually saying all you need is love and money can't buy me love. It's a return to The Beatles, and I think that's an appropriate sentiment for where the world is at the moment. We didn't sit down and plan to do that, it just came out, but it's definitely a song for 2009." x They worked on the song from May 2008 until just before Christmas that year. Neil Tennant told Music Week: "Brian kept endlessly tweaking it, but I've never got sick of it. It sounds like us, without really being like anything else we have ever done." x Speaking to The Word magazine, Neil said that he had a very heated debate with Brian Higgins over "Love etc. ": "He wanted the chorus to happen twice at the start to establish it. I agreed, but insisted it had different lyrics. Well, he was having none of it. And neither was I. You can't just repeat it - it'll be boring! I thought his head was going to blow off." x "Love, Etc." is simple and playful. There's the keyboard line, which is almost as endearingly unpretentious as Depeche Mode's "Just Can't Get Enough" or Kylie Minogue's "Can't Get You Out Of My Head," at least in intent. And then the big, stadium-chant glam chorus that, while unquestionably catchy, could've come off ugly in other hands. The gentle smile of the song is something Pet Shop Boys haven't done in a long while. The whole thing's very even-paced, too, but still effective. It's hard to tell if it'll eventually be forgettable or a smart, little thing that latches onto your brain quite a lot over the next few months. x It is plucky and weird. A grower. Love etc. begins with a gorgeous climbing vocal on the intro. How does this man sound so crystalline 25 years on? Does he keep a rotting portrait in the attic? The chanted don't have to be chorus - the "A" chorus - is a surprise. It's like Girls Aloud did the verses and handed their footballer boyfriends the mics for the chorus. The "B' chorus, where the shouting hooligans drop out, is beautiful in a Loving Kind fashion. You need more gets repeated over and over - a sticky hook. If 2006's Fundamental and, in particular, its lead single "I'm With Stupid" was a last nod to the PSBs 1980s heyday, then "Love, etc." is a yet another offshoot into a cooler, more bold direction. x If I had to find a comparison-point, I'd say Very's classic hit "Can You Forgive Her?". Both the old song and this new song have a similar tempo and rhythm, plus they both open their respective albums. That's where the similarities end though. Love Etc is clearly influenced by what's going on in the world of pop today - it's slick and cool, and, uh, Girls Aloudy. Although with a heavy PSB vibe, and naturally it's Neil Tennant singing instead of some forgettable songbirds, but the Xenomania-influence is definitely showing up here. It's also hypnotic, groovy and has a quirky vibe to it that makes it quite a different beast and which definitely lends it its own flavour. It damn well does stick to your head though which makes it a rather nice choice of a single. The best part? The chorus-of-sorts with the call-and-answer shoutalong. Bloody brilliance that.